I also got to make something I've had on my list to do for ages too! Every time I have a cold I always eye up the empty tissue box and say I can totally do something with this and then it gets thrown out. 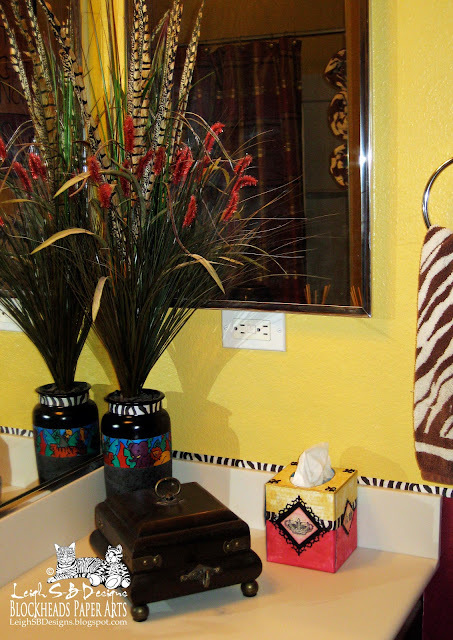 So I finally did it and made a fancy tissue box to go in my French-African themed guest bathroom! 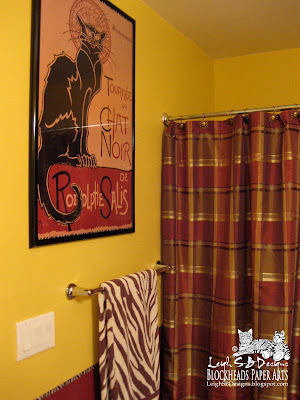 I designed and decorated my guest bathroom with the large French Black Cat poster as the basis of my inspiration. Every room in my house also has an African theme going on too so of course I couldn't resist those cream/brown zebra towels and included the zebra ribbon border on the walls to continue the recurring theme. I also painted the ceramic vase in the photo many moons ago which is a combination of fired glazes and metallic acrylics and I added the zebra ribbon to it and in the poster frame to make everything tie in together nicely. I then incorporated all the elements of my guest bathroom into my altered Tissue Box! 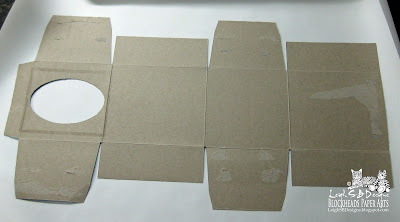 Deconstruct the tissue box and cut a large piece of white paper large enough to fit the entire box shape. Adhere the paper to the plain side of the box with a glue stick and cut out. I divided all 4 sides of the box into 2 sections with the lower section being the larger portion to match my two-toned guest bathroom walls which are goldenrod yellow and a red-magenta colour. 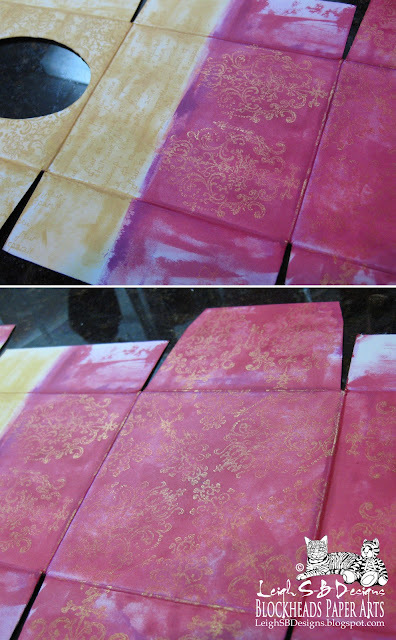 Stain the sections of the box with Colorbox Fluid chalks: Yellow Ochre on the upper sections and then a combination of Dark Peony and Warm Red on the lower sections. I wanted a distressed look so left some of the white areas showing through while applying the inks in the Direct to Paper method. 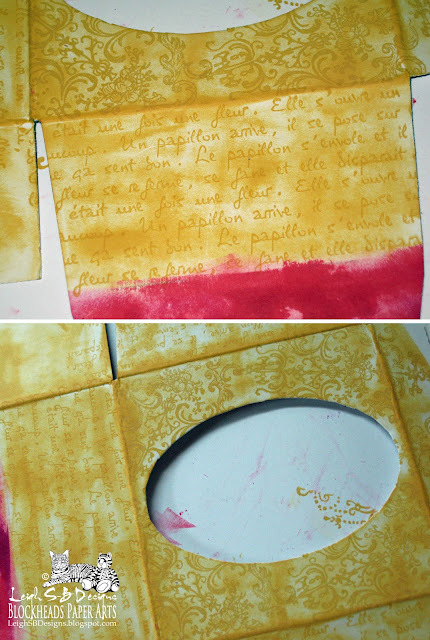 In the upper side sections of the box stamp the French Script background image multiple times in Yellow Ochre Colorbox Fluid Chalk. 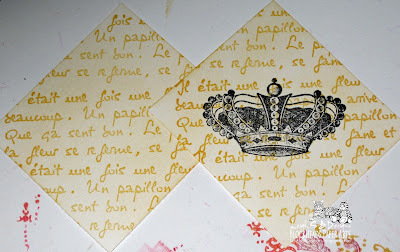 Mask off the box lid with post-it notes and stamp the Regal Flourish design multiple times in the same colour. 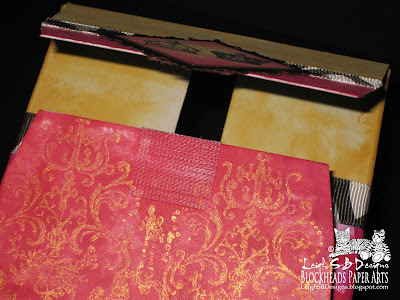 Edge the lid and the oval cut out with a metallic gold paint pen. 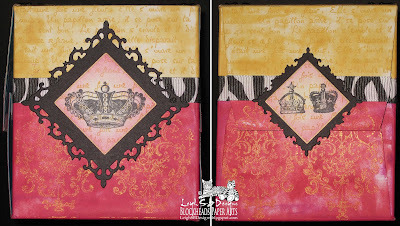 Stamp the same Regal Flourish design multiple times across all the lower sections of the box and on the base in Brilliance Rocket Red Gold pigment ink. Re-assemble the box and adhere all the flaps with double-sided tape except for one side which will remain open so that the box can easily be re-filled with tissues. Adhere the zebra ribbon around the box with double-sided tape. Start on one side flap of the side of the box left open and finish on the other side flap. Adhere a strip of ribbon to the top flap on the side of the box left open, which you can see in the photo above on the right. So when the box is closed the ribbon looks like it wraps all the way around. 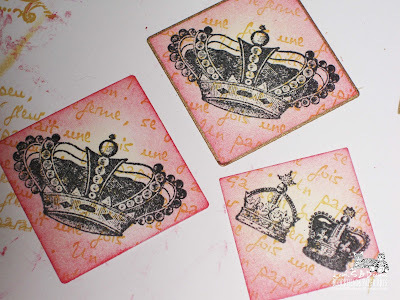 Use an Ink Applicator tool to lightly stain four small pieces of white cardstock and stamp the French Script background all over with Yellow Ochre Fluid Chalk. 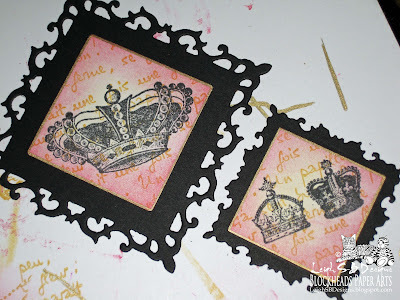 Stamp the Crowns with Memento Tuxedo Black and die cut them out with Spellbinders Square dies in two sizes. 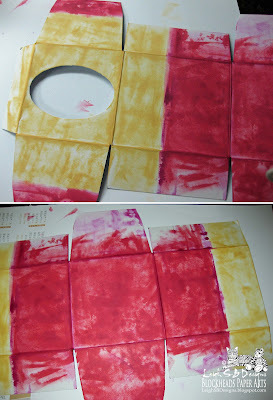 Apply Warm Red Fluid Chalk to the outer edges of each square and edge with a metallic gold paint pen. 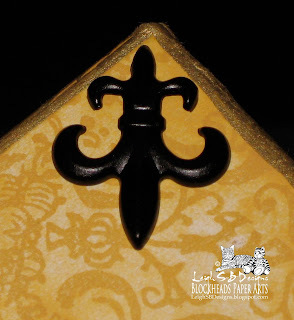 Die cut out Spellbinders Fleur De Lis mats in two sizes and mount the crown panels to them with double-sided tape. 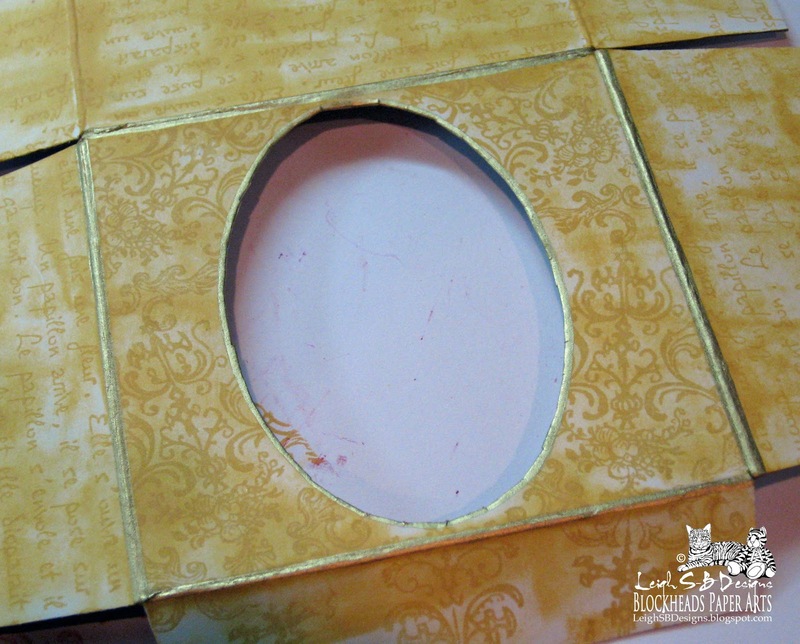 Adhere the panels to the sides of the tissue box with double-sided tape. For a box closure add a self-adhesive transparent velcro square to the inside of the flaps on the open side of the box. It's super easy to remove the tissues from a new box and just slip them inside! Thanks for visiting with me today and before you go I just want to quickly remind you about the current Blockheads Blog Hop Technqiue Challenge I'm hosting this month! There's still about 2 weeks left to take the Challenge so check out all the info here! For even more Blockheads inspiration check out the wonderful artwork by my fellow design team mates Karen, Colleen and Leslie and also the Blockheads guest designers (blog links located in my left sidebar)! Oh, Leigh! This is super cool, as is your bathroom! ANd Happy Birthday, too. Bet you're proud of this tissue box, and you really should be. It's awesome! WOW! What an awesome project! I absolutely love your tutorials - you cover every single step in detail and your pictures are always fabulous. 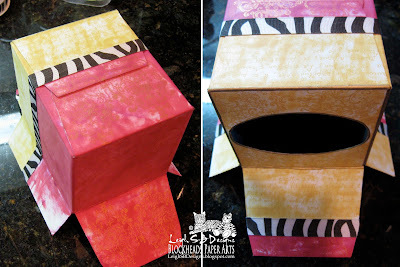 Thanks for sharing this gorgeous tissue box! It looks fabulous in your guest bath! Very Regal! 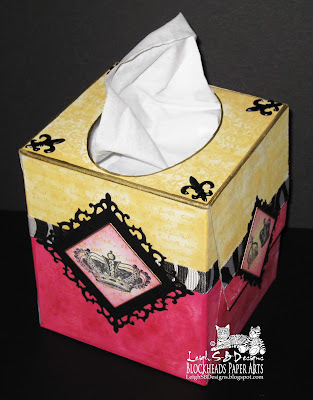 Leave it to you to turn a tissue box into a gorgeous decorative piece. Love it!